CBS may have just given a gift to Zullo / Team Arpaio. You can follow the link if you’re interesting in the tortured explanation that follows. I tried to summarize it, but just couldn’t find anything to say that made sense. We have been monitoring him for the last eight months, and on that broadcast, Mr. Reilly gave me a gift: we have been waiting for him to come off of an internet broadcast and finally do the slanderous hit-job that he did on public airwaves. Finally, the Xerox 7655 has been a gift. Giving the CCP the ability to determine exactly which anomalies were and were not produced by the Xerox 7655 has been a blessing. 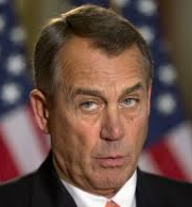 For the second time in two months, a law firm has dumped Speaker of the House John Boehner and refused to represent House Republicans in their lawsuit against President Obama. Commenters on that site have come up with the obvious solution, an attorney who would certainly be willing to sue President Obama, Orly Taitz. 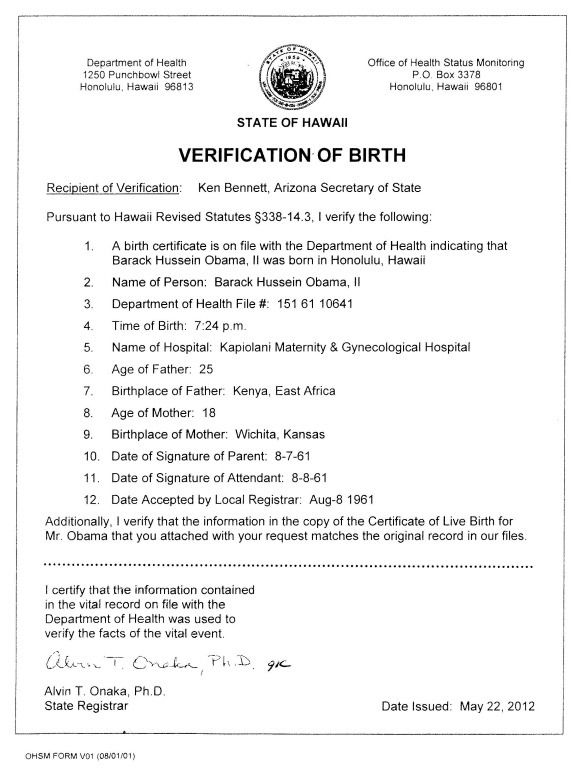 After two years of denying he personally profited from the Maricopa County Sheriff’s Office investigation into the validity of President Barack Obama’s birth certificate, the head of the sheriff’s Cold Case Posse [Mike Zullo] admitted to CBS 5 Investigates that he accepted a large monetary gift from one of the sources in the investigation. If Zullo had been a real law enforcement officer and someone related to an investigation gave him $10,000 for his personal use, I think most people would call it a bribe. But then Mike Zullo is not a real law enforcement officer and he is not bound by any legal or ethical rules in his attempts to get some dirt on President Obama. The Maricopa County Sheriff’s Office declined comment on whether they thought such a gift was proper. The $10,000 came from someone whose name I didn’t immediately recognize, Bill Wolf, but it turns out that Wolf supplied not only money to Zullo, but was also a major source for investigative material. (Wolf was also a plaintiff in a 2011 lawsuit against Loretta Fuddy and the Hawaii Department of Health.) Zullo finally came clean about the money in a series of emails, linked from their story. Wolf is deceased, so we can’t ask him about any of this. I thought the Morgan Loew story was very effective. Footage from the Joe Show corroborates Reilly’s claim on camera that this the birther investigation was all about getting campaign donations. It shows Zullo denying accepting money one day, and admitting it the next. It brings in the IRS loophole (what Reilly calls a “black hole’) that keeps their money off the books. 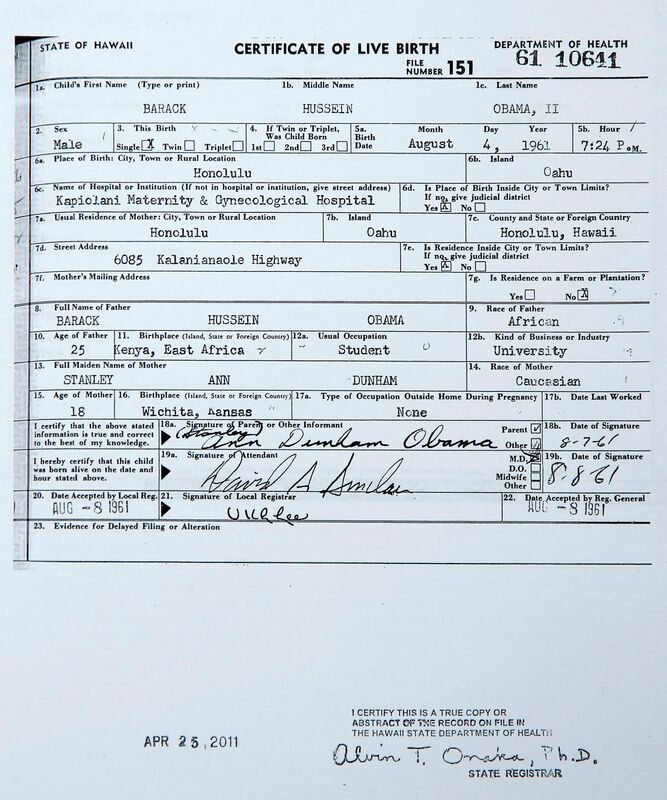 It points out that even after Secretary of State Bennett authenticated the birth certificate, WorldNetDaily and the Cold Case Posse are still soliciting donations. For someone like me, the story had almost nothing new, but the report makes a strong case and this package on a major local news outlet must have appeared shocking to some folks in Phoenix. Thank you for contacting me about President Obama’s right to hold the office of the presidency. I appreciate hearing from you. Like you, I believe the Constitution must be our nation’s guiding document, including its provisions specifying the requirements that must be met for an individual to hold the office of President. 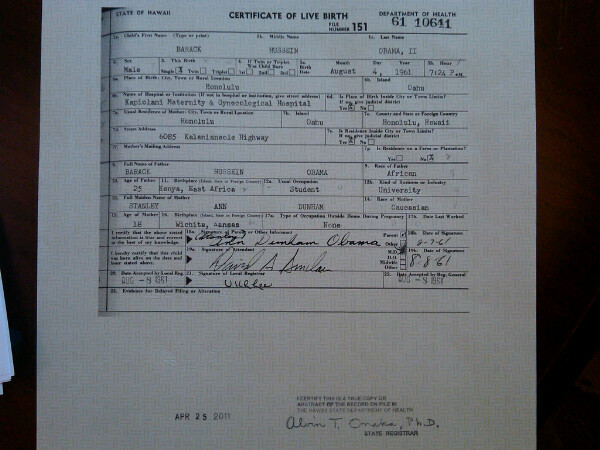 President Obama was qualified to run for this office by the Federal Election Commission, and courts have dismissed all lawsuits challenging his status as a natural born citizen of the United States. As such, I believe President Obama to be the legitimately elected leader of our nation. Thank you again for contacting me, and please do not hesitate to do so in the future. It is an honor to serve you and the 4th Congressional District. Rep. Gowdy (chairman of the House Select Committee to investigate the 2012 Benghazi attack) does not have a Democratic opponent in the 2014 4th District House of Representatives election, but is opposed by Libertarian candidate Curtis McLaughlin. 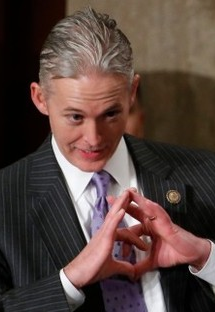 Gowdy is favored to win. 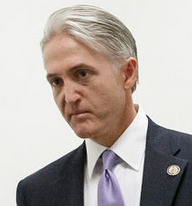 Some have suggested (here and here) that Gowdy should be elected the next Speaker of the House. Gowdy was rated 0% by the National Hispanic Leadership Agenda, and 100% by the National Retail Federation, the National Association of Manufacturers and the National Federation of Independent Business. I’ve said it before and I’ll say it again. I greatly appreciate it when local newspapers cover local birther events. This time it is the Brownsville Valley Morning Star’s coverage of the Taitz v. Johnson hearing yesterday by reporter Emma Perez-Treveño. “If you want to go there, you are going to have to show me,” Hanen told Taitz. Taitz told Hanen that he has the right to issue a writ of mandamus to force Burwell to issue an order of quarantine. 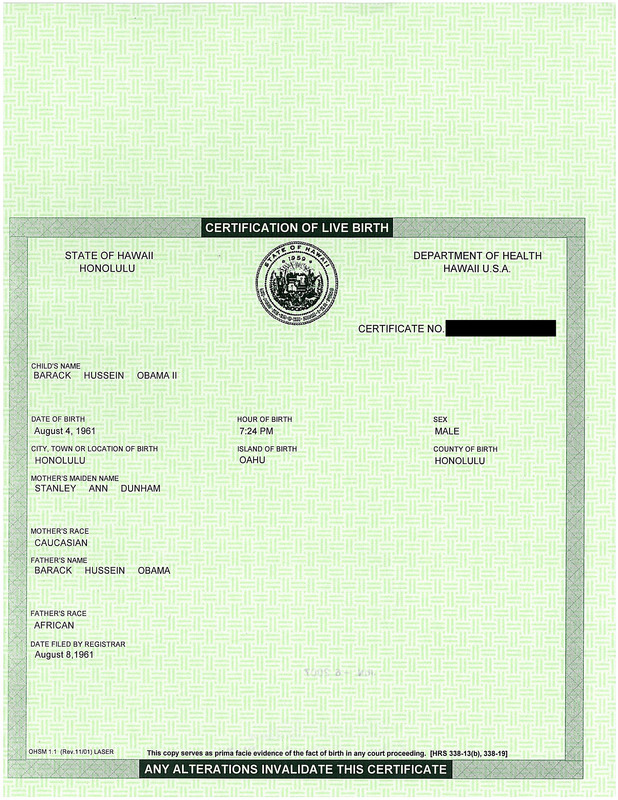 But Hanen pointed out that the law authorizes, but does not mandate that Burwell issue such orders. “Why are we here if you find there is nothing you can do?” Taitz asked Hanen amid his observations. “We are here because you filed a lawsuit,” Hanen told her. 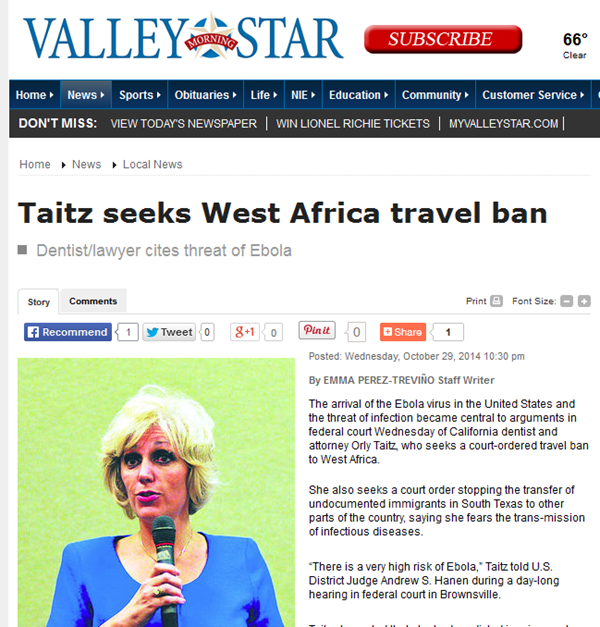 “I’ll let you question the witness Dr. Taitz, not me,” he added. Taitz told Hanen that he was refusing to consider the threat of injury to her. “Show me case law,” Hanen told her. 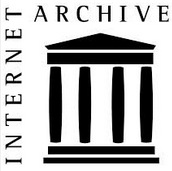 “Does the case law provide that? What is the likelihood that it can happen? There is no certainty with Ebola or that you would be affected by it,” he continued. It was noted that the threat must be actual or imminent, not conjecture or hypothetical. “You’re going to have to show me that it’s not hypothetical,” Hanen told her. Taitz herself did not testify at the hearing, but her “expert witness” Vera Dolan did. The government stated that “a cough is a symptom, not a diagnosis” and Taitz doesn’t know what caused it, and even if she did catch a respiratory infection from one of the immigrant children, that child could have caught it in the United States. Taitz should go to law school and learn about this stuff. I personally think that Judge Hanen is out of line holding this hearing at all, until after the question of standing has been settled. Without standing, he has no jurisdiction. But then, I haven’t gone to law school. Former CBS News correspondent Sharyl Attkisson’s computer was hacked, or so she says in a new book “Stonewalled: My Fight for Truth Against the Forces of Obstruction, Intimidation, and Harassment in Obama’s Washington.” She says her phone’s acting funny. Oh, and her TV is on the fritz too. The mysterious government IP guru, “Number One,” found “classified documents deep inside her operating system” possibly put there to frame her. I might expect this story at Western Journalism (which has it) or Fox News (which has it), but I’m reading the Washington Post. Why the intrusions? Attkisson believes it is the result of her Benghazi reporting. You remember, that scandal where nobody did anything deliberately wrong? The story reads more like a thriller spy movie than a news story (“Suddenly data in my computer file begins wiping at hyperspeed before my very eyes”). Most of Attkisson’s security expert sources are given pseudonyms, and the one real name she gave won’t comment. It’s a serious accusation, but completely unverifiable at this point.